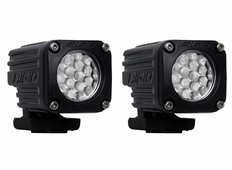 The Rigid Ignite series of LED Lights feature the smallest, most versatile lights in the Rigid Industries� product line! Perfect for any application where short range light output is needed, don't be fooled by the small size of these lights. Measuring just 1.4" x 1.4" x 2", these lights pack a serious punch for their size, emitting 1000 lumens!. Each Rigid Backup kit comes with two Rigid Ignite LED lights, which should be plenty to light up the area behind your vehicle. Your Rigid Ignite LED light will come with standard mounting brackets, and related hardware.